Wait… Is That Lichen on My Chair? Luckily, I Spotted This Tiny Member of the Arboreal Choir (Hyla versicolor), in the Nick of Time! If you live in North America, chances are you’re more familiar with the springtime song of gray treefrogs (Hyla versicolor), than you are with the colors and patterns of this amphibian’s chameleon-like skin. The gray treefrog is a tiny creature —measuring less than 2″ long— and with its highly-effective camouflage, it often escapes detection. In fact, these little fellas blend in so well with their surrounding environment, I nearly mistook one for lichen on my old lounge chair. Luckily — just before sitting down— I paused to get a closer look at the “lichen” growing on my chair. Well… Hello friend! The North American Gray Tree Frog (Hyla versicolor) is most famous for the bird-like, musical trills made by male frogs during the mating season (click here to listen), but its ability to change color —much like a chameleon— is another unique characteristic. Depending upon its surroundings, the tree frog’s skin will change color within seconds; from nearly white to nearly black, as well as various shades of green, gray and brown in between. The treefrog is a great garden-friend, consuming a wide range of insects; including flies, beetles and caterpillars. 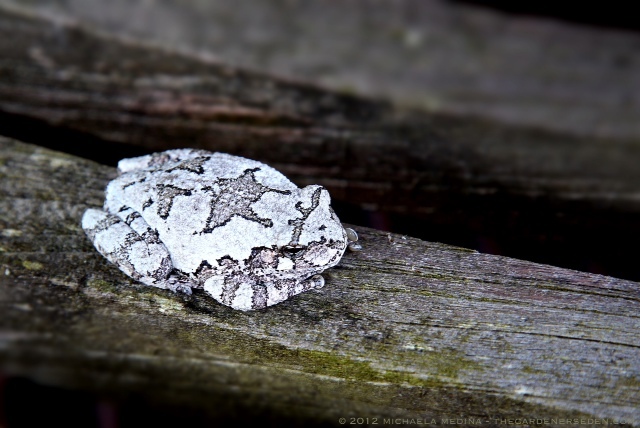 Learn more about the gray treefrog by visiting AmphibiaWeb, linked here. Listen to the Gray Treefrog at Mister-Toad’s Website linked here. 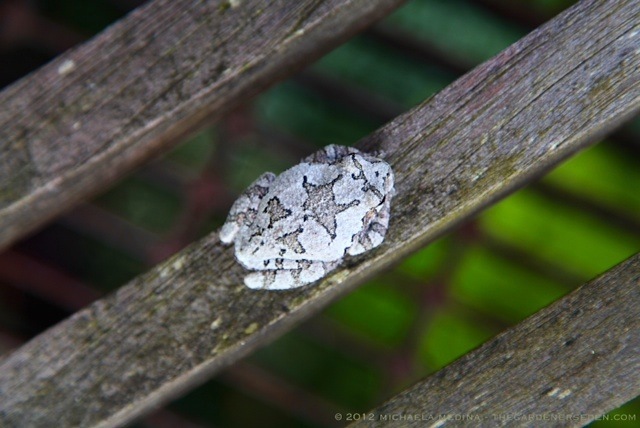 § 4 Responses to A Surprise Visit from the Gray Treefrog: Musical Chameleon of the Native Forest"
You are currently reading A Surprise Visit from the Gray Treefrog: Musical Chameleon of the Native Forest at The Gardener's Eden.